To stand any chance of keeping global warming below dangerous levels, a large percentage of fossil fuel reserves need to stay in the ground unburned.1 Lord Stern endorses an estimate of 60-80% of current reserves being unburnable, assets which support share values of around $4 trillion, about 27% of US Gross National Income ($15 trillion), or about 5% of Gross World Product ($85 trillion).2 As Jason Moore highlights, there have been energy transitions before: "from peat and charcoal (1450s–1830s), to coal (1750s–1950s), to oil and natural gas (1870s–present)" - however the difference is these have been additive, whereas a transition to renewables must be eliminative. That means leaving these resources in the ground amounts to writing off many hundreds of billions of dollars’ worth of assets, and that's before taking into account all the infrastructure that depends on fossil fuels - refineries, manufacturing processes, power plants, airports and conventional agriculture. Furthermore, capital is not just a lump of money, it's a lump of money in motion, money making money. That means writing off the current value of already invested wealth would involve writing off all the future wealth that capitalists in the petrochemical industries hope to own in the future as a result of their investments. Not to mention the other capitalists selling products to petrochemical companies. It is hard to imagine these capitalists writing off that wealth voluntarily. As Karl Marx puts it, with unintended valence as the ice caps melt, "Après moi le déluge! [after me, the flood] is the watchword of every capitalist and of every capitalist nation." By consistently overvaluing the fossil fuel assets of companies, the argument goes, the world's financial markets are with gusto busily inflating a 'carbon bubble', which, if burst, could spell ruin for investors. It is no surprise then that individuals, corporations and pension fund holders are beginning to wake-up to the risk and either starting to divest from fossil fuels or seriously considering it. Even the World Bank has stopped lending for new coal-fired power plants. The most obvious objection here is that while the sub-prime bubble arose out of endogenous crisis tendencies within capitalism, any mechanism to leave fossil fuels in the ground would be politically determined. That is, it would be undertaken voluntarily by the state, either unilaterally, or as part of a multilateral agreement such as the supposed Kyoto Protocol successor which is meant to be agreed in Paris in 2015. In other words, the carbon bubble only becomes a bubble if policymakers legislate it such. It's hard to see why states would create such an economic crunch voluntarily. The most vaunted proposed mechanism for leaving fossil fuels in the ground came from the Ecuadorian government. They proposed that in return for leaving oil reserves under the Yasuni National Park untouched, the world pay Ecuador half of the estimated value of the reserves up front. This proposal was positively received by mainstream environmentalists as well as Marxist radicals.3 However, it wasn't so well received by the rest of the world: nobody offered to pay. It later transpired that during the proposal, Ecuador had been secretly negotiating extraction concessions with China. Whether or not this was evidence of duplicity, or simply pragmatic contingency planning, the failure of the Yasuni proposal seriously damages the prospects for leaving fossil fuel reserves unexploited. If states aren't willing to pay to leave resources in the ground, they're certainly not going to just write them off. The passage from Marx quoted earlier continues: "capital is reckless of the health or length of life of the labourer, unless under compulsion from society" (our emphasis). Marx was discussing the struggles over the length of the working day in Victorian England, but the argument applies just as pertinently to the health of the ecosystem. We are skeptical that policymakers alone will take the steps necessary to provide 'compulsion from society' to constrain capitalists. The state may intervene, but only if the state itself is compelled by some big push. Aufheben argue that when it comes to climate change, there are two principal capitalist fractions. The incumbent fossil capitalists are exemplified by the fossil fuel interests who've funded the climate change denial PR. The green capitalists on the other hand are spearheaded by sections of finance capital, especially the reinsurance industry.4 It is important to recognise that both these fractions exist, and that their material interests diverge somewhat when it comes to climate policy.5 But given the required asset write-offs and developmental path-dependency, it's hard to see how the green capitalists could gain ascendency, except perhaps by harnessing social movements into a reformist program at the expense of the fossil capitalists. In order to move from the current fossil-fuel dependent development path to a renewable one,6 a significant period of economic contraction, stagnation, and restructuring would be required. There are few historical precedents for such a rapid and dramatic reorganisation outside of wartime. Perhaps the closest historical parallel is with the struggles over the abolition of slavery in the US. There are of course major historical differences between 19th century and present-day capitalism. We don't want to collapse these, but we do think it's worth looking at previous instances where large amounts of capital have been written off due to a change of development path.7 As Doug Henwood puts it, "the liberation of the slaves after the Civil War was probably the greatest expropriation of capital in history." In part two of this article, we will explore the abolition of slavery as an historical analogy to bursting the carbon bubble. 1. This assumes no dramatic breakthroughs in carbon capture and storage (CCS) technology, but even then a huge new CCS infrastructure would need to be rolled out at great cost. CCS is a big topic covering a family of technologies which we plan to write about in future. 2. Bill McKibben's article Global warming's terrifying new math is a great primer on these numbers and what they mean. The eagle-eyed may notice we’re comparing a stock (asset values) with a flow (annual national income/world product). The reason for this will become apparent, as it allows the most meaningful comparison across century time-scales by relating asset values to the contemporaneous size of the economy without complicated attempts to take account of inflation. 3. For mainstream, see Mike Berners-Lee and Duncan Clark, The Burning Question, endorsed by the Prince of Wales. For Marxists, see John Bellamy Foster, Brett Clark, and Richard York, The Ecological Rift. 4. Re-insurance is insurance for insurance companies. Insurance companies exist to provide capitalism-compatible solutions to the financial costs of unforeseen events. They provide financial security. The idea is that one person's misfortune can be blunted by redistributing the costs, sharing them among a larger group. So, if a home owner insures their house and it burns up, the insurance companies pays them for the insured value of the house, and passes a small share of that cost on to policy holders in the form of premiums paid. One person's loss of a home has massive financial costs for that individual (to say nothing of nonmonetizable personal costs). But if we take that person's financial cost for their home and divide it up and share it out among a million people, it's a small cost. That's part of what insurance does. But what happens when a million people's homes burn up? Catastrophes like that overwhelm insurers' abilities to spread risk. One solution to this problem is that insurers themselves buy insurance. The theory is the same as with regular insurance: one insurance company may have catastrophe befall enough of its policyholders that the company can't pay out. That's a financial disaster with huge costs for that one insurance company. But if the costs of that disaster are spread across a thousand insurance companies, the costs are relatively small. This is what re-insurers do. They sell insurance to insurers. And climate change makes catastrophes likely that will affect huge numbers of insurance companies. (If this sounds inhumane in a way, caring about insurers' bottom line instead of the human costs of climate change, that's because it is: because reinsurance capitalists are still capitalists.) This gives re-insurance companies a financial interest in reducing the effects of climate change. 5. Complicating this somewhat is the fact Shell has publicly called for a 1 trillion ton cap on greenhouse gas emissions. This could be pure PR and they're privately lobbying the other way; it could be enlightened self-interest if they think they're well-positioned with renewable technology and intellectual property; they could also think a hard emissions limit will drive the necessary state support for Carbon Capture and Storage, thus protecting the value of their fossil fuel assets. 6. Though not necessarily sustainable - climate change is only one of the capitalist environmental disasters, e.g. see the Stockholm Resilience Centre’s 9 planetary boundaries analysis. 7. One important difference is that in 1850, cheap and abundant fossil fuels could be used to substitute for human muscle power once slavery was abolished, and indeed continuously, as rising productivity replaced labour with machines. But now the era of cheap energy is over. 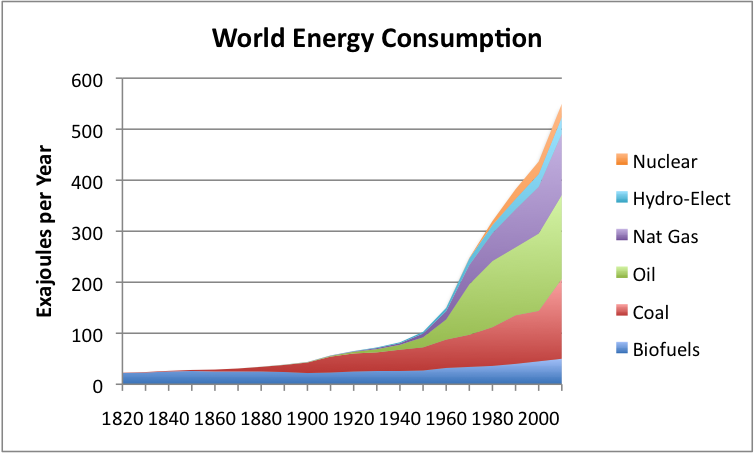 A huge amount of capital is bound up with fossil fuels, creating a strong path-dependency for capitalist development. While a capitalism based on renewable energy is theoretically conceivable, there's no easy path between the present reality and the hypothetical green alternative.